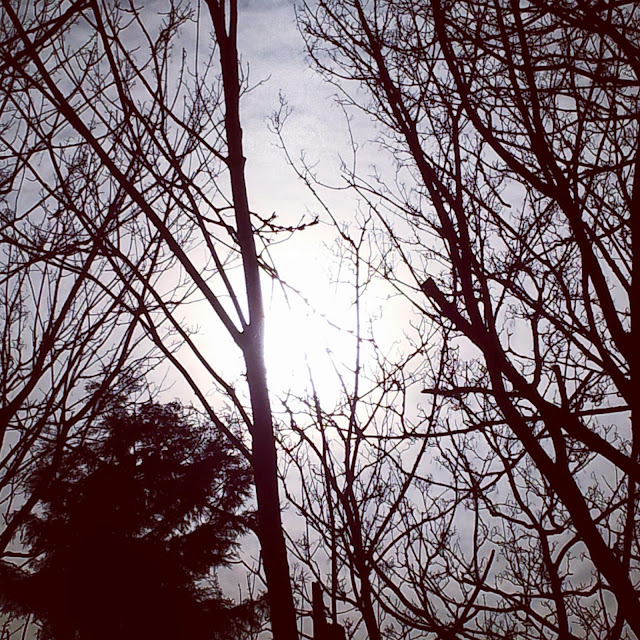 Looking back over the past few weeks, we enjoyed a partial eclipse in the UK on the 20th March. Predictably that morning was cloudy, so while it went semi dark, the birds stopped tweeting and the light levels were odd, that was as good as it got. An eclipse viewed through cloud. We had however been prepared and had a sheet strung up between the tree, swing frame and washing line, ready to project the sun onto by various means (the colander was the most impressive). We also made pinhole projectors out of cereal boxes. 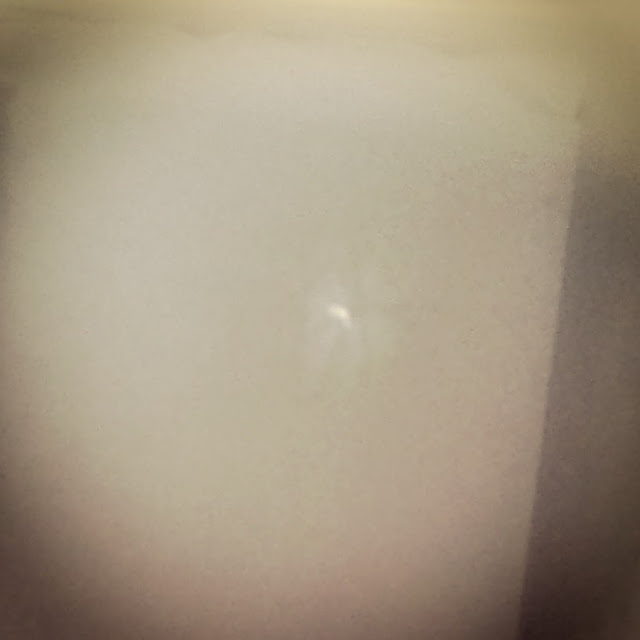 The cloud parted and we saw this in our pinhole projectors. 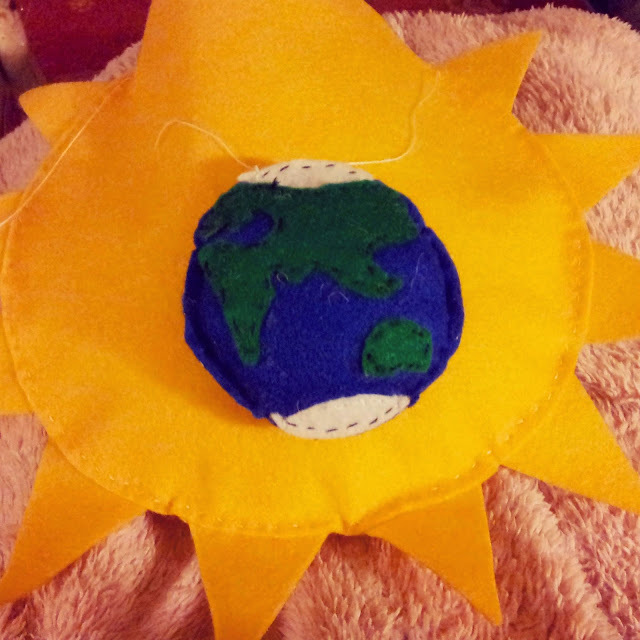 Not to worry though, as an eclipse meant lots of talk of the Sun, Earth and Moon and an excuse to craft in felt. 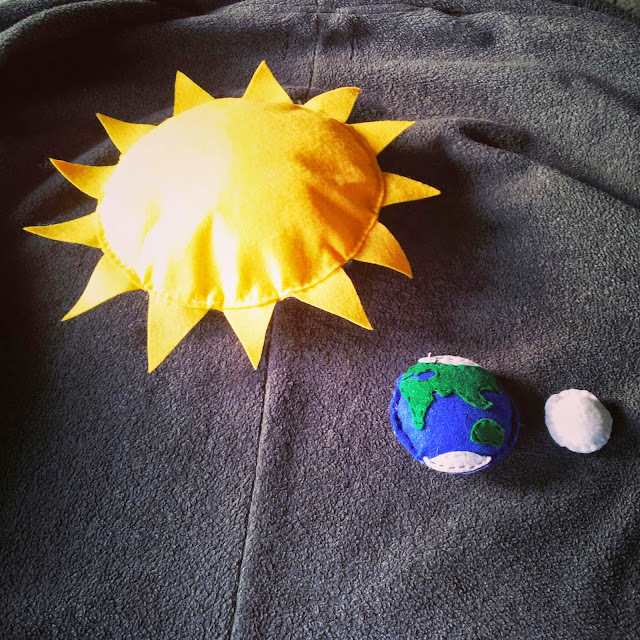 The Sun, Earth and Moon - in felt. 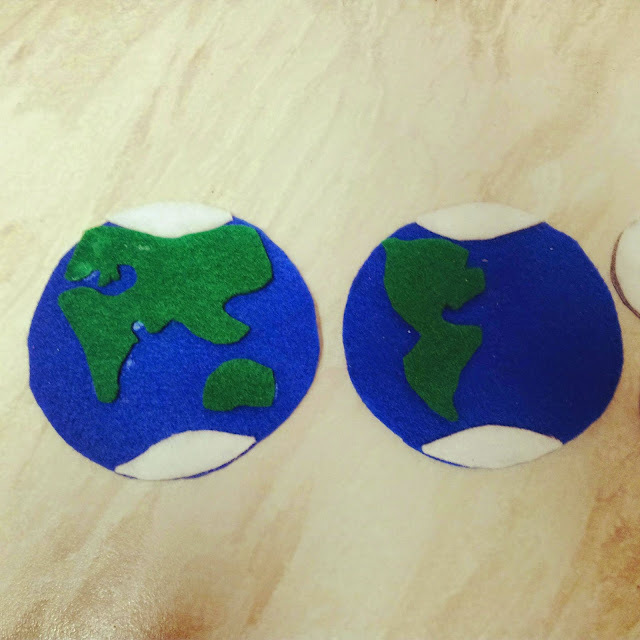 This was the first time I've tried to make planetary bodies out of felt and it was not as easy as I'd hoped. Indeed, it took two attempts to make the moon, as I originally tried to use two layers of felt, one white with holes cut in it glued over a grey layer to try to simulate the Mara. The result of applying glue was felt too stiff on this scale (about the size of the bottom of an egg cup) and I couldn't push a needle through to sew the two halves together! The Sun was a straight forward pair of circles, the size of one of M's plates, with triangles of felt sewn between the layers. Very easy but effective. The Sun in progress, together with the Earth. The Earth was more difficult. M loves Italy because it is boot shaped and believes it should feature prominently on any physrep for the Earth. I used the bottom of a mug to draw the circles and had to sketch out land masses to fit on a piece of paper. I cut these out and pinned them to the green felt so I could cut around it. Each continent was glued in the appropriate place to a blue circle and then top-stitched to keep it in place. The Earth in two halves. The set took me two nights to make up and M painted a bag for them to live in. 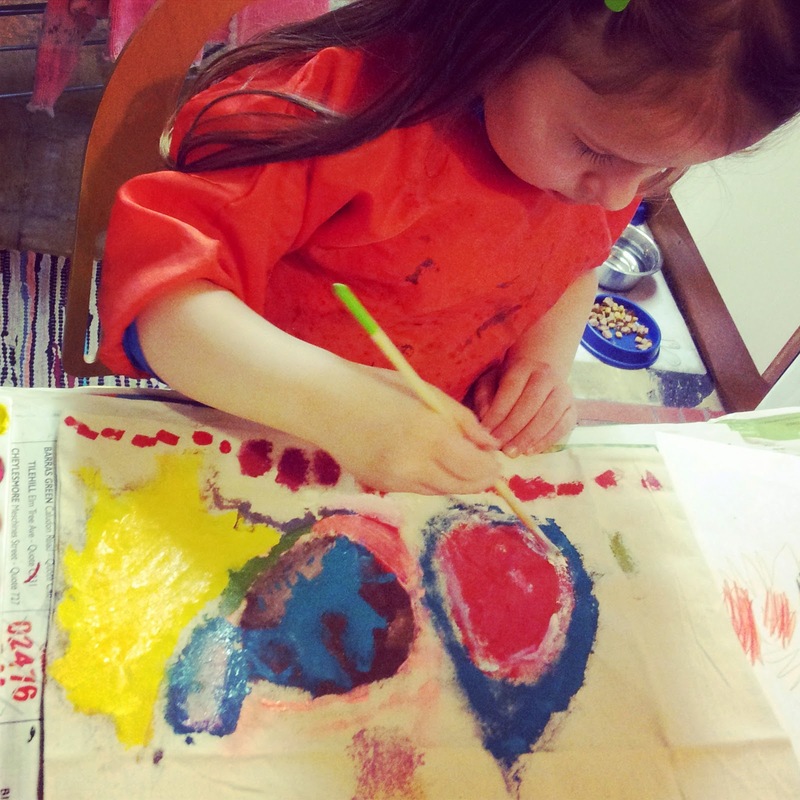 M paints the solar system onto a canvas bag. The vague plan is to make an entire solar system... Eventually.